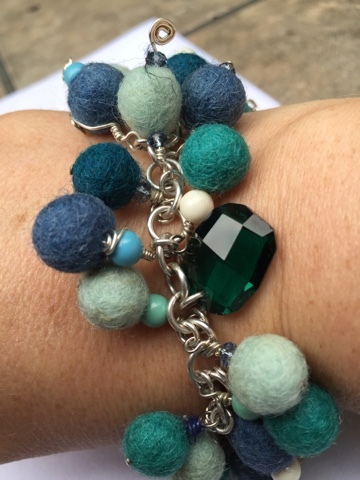 About four years ago I designed this bracelet featuring felt balls and it is still in "heavy rotation" in my jewellery collection. I get so many compliments on it that I decided I'd offer a quick online tutorial on how to make one of your own. Optional: Vintaj brass rectangular blank embossed in Big Kick with alphabet plate then enhanced with Gilders Paste "Patina"
1. Create a one in one chain using your 16 ga 5mm jump rings. Make it at least 69 rings long. If you don't want to make your own chain just purchase a pre-made rolo chain - just make sure the inside diameter of the rings is big enough to get at least two jump rings through and allow space for them to move around. 2. Wire wrap a selection of your felt balls (or beads) and mix it up using crystals and pearls on some. 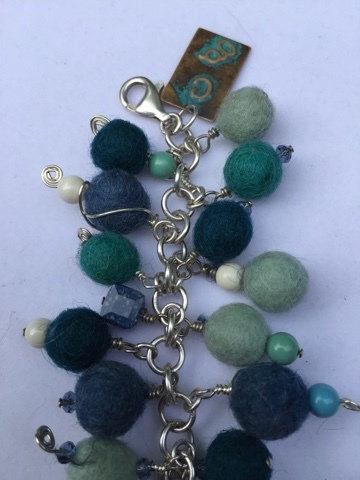 Check out Sharilyn Miller's book Bead on a Wire for great instructions on wire wrapping. I created coils at the ends of some felt balls. Others I wrapped around the ball from top to bottom. See second from the top on the left. 3. Some of the felt balls just need a head pin through them. Use a large needle to create a hole for the headpin to follow, as the wire is too flimsy to make its own path through the felt. It's better for the overall bracelet design to have some longer, some shorter, each one slightly different than the other. It's the shape and colour family that makes the overall look so cohesive. 4. 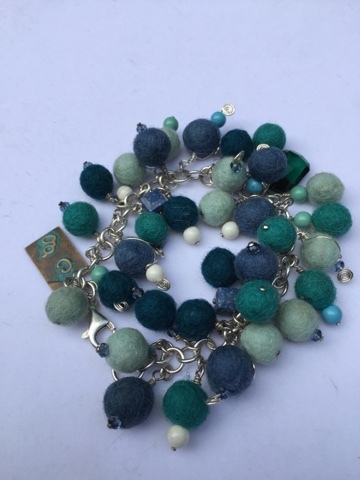 Add the felt balls in a random pattern to the chain using the 18 ga rings. I paired them up, one on each side of a ring, skipping a jump ring between each pair. 5. Put three or five (always working in odd numbers) crystals or accent beads onto headpins and wire wrap the tops. Add these with the 18 ga jump rings throughout the bracelet onto jump rings between pairs. 6. To finish the bracelet, add a clasp of your choice. I added an extra 16 ga jump ring then put a lobster clasp on mine. The lobster hooks into an 8 mm jump ring. And there you go! Easy and elegant and so so light on your wrist.